Product prices and availability are accurate as of 2019-04-18 08:10:50 EDT and are subject to change. Any price and availability information displayed on http://www.amazon.com/ at the time of purchase will apply to the purchase of this product. 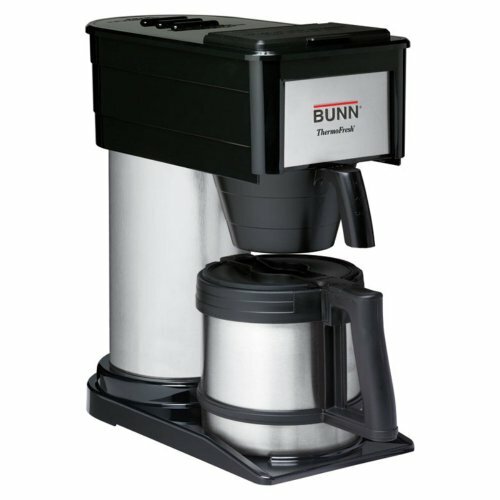 Commercial-grade construction and loads of easy-to-use, convenient features make the Bunn BTX-B Coffee Maker - High Altitude the ultimate machine for true aficionados. This high-quality brewer makes up to 10 cups (50 ounces) of coffee in just three minutes, and keeps hot water for tea or soup constantly at the ready. No separate warming plate is necessary - your brewed coffee stays hot and fresher longer, without overheating, thanks to the stainless steel vacuum-insulated carafe. The carafe is double-walled for total insulation, plus virtually unbreakable and even dishwasher-safe for easy clean-up between pots.This high-altitude option is designed specifically for use at high altitudes, where regular machines often have trouble performing perfectly due to changes in temperature and pressure. The high altitude unit is specially engineered with its own thermostat that is meant specifically for use above 5,000 feet. There are various cities in multiple states across the U.S. where use of a high-altitude machine is recommended for best results. The trick to great coffee is having a machine that can extract maximum flavor without overheating and scalding the coffee, but without underheating and not getting the full strength of the grounds. The BTX-B has a holding tank with an watt heater and its own internal thermostat, which help hold your brew water at approximately 200F - the ideal temperature required for best results. It's the same temperature used by quality coffeehouses. What's more, you get the benefits of the patented Bunn brewing system, which doesn't just drip water straight through the center of the coffee like many machines do. Instead, there's a specially designed sprayhead that gently showers the coffee, creating just the right amount of turbulence to activate flavor and ensure a balanced taste.